April 12 is a date to remember. Liberians immediately think of April 12 1980: the day Master Sergeant Samuel Doe seized power and the country made a U-turn from which it still has to recover. Ivorians now have their own ‘April 12′: the day Alassane Ouattara finally got hold of the presidency, after the arrest of his opponent, the incumbent president Laurent Gbagbo who refused to give up power peacefully after losing the elections. Early December 2010 both men were sworn in as the country’s new president. For the past four months, the country has been on the brink of a civil war – and it still is. 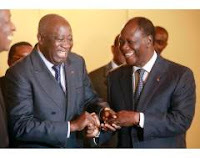 Alassane Ouattara got 55% of the votes, Laurent Gbagbo 45%. While publicly fighting, the two opponents seem not to dislike each other. However, after the fighting started, tens of thousands Ivorians have fled to neighbouring Liberia, maybe even more than a hundred thousand. See my December 9 posting, ‘Liberia and the Ivory Coast Crisis’, which also explains the power vacuum left by the death of the country’s first president, Félix Houphouët-Boigny, in 1993. Since then, the country has experienced turmoil. Will that be ending now? Where will Ivory Coast be heading to? In my opinion there are three options. First, and let’s look at the Ivorian scene from a positive and optimistic angle, Allassane Ouattara - his name indicates his Burkinabe origin – manages to install himself as the country’s legitimate president and convinces his fellow-countrymen to forget about revenge. After all, some 45% of the people voted for Gbagbo. The exodus of Ivorians now taking place contradicts the probability of this option. People who are fleeing and leaving the country are not thinking of revenge but they may translate the feelings of people in their community who decide to stay. The abundance of weapons in the region is another reason to worry. This brings me to the second option. 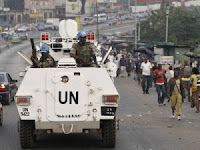 Another civil war will ravage the region – after the wars in Sierra Leone and in Liberia. In this option there will be rising numbers of IPDs, internally displaced persons (Ivorians who look for a safe shelter within their own country) and of refugees, people fleeing to neighbouring countries: Ghana, Burkina Faso, Mali, Guinea and Liberia. It will be clear that in this option the regional perturbation may inspire governments of countries involved – directly or indirectly – to intervene, openly or covertly. This reaction might not be restricted to neighbouring countries. The regional ‘policeman’ - Nigeria – may be willing to intervene, to confirm its positions as the region’s superpower. This brings me to the last option: foreign intervention. Just as France intervened military in Ivory Coast, which made yesterday’s arrest of Laurent Gbagbo possible, Nigeria may have its own reasons to intervene. After all, Nigeria did come to the rescue of Liberia, in 1990. The reasons are known, allegedly ‘special’ relations between then Nigerian President Ibrahim Babangida and the Liberian President Samuel Doe. This week, presidential elections will be held in Nigeria and most likely the incumbent president Goodluck Jonathan – who took over from president Yar’Adua who died in office - will win the elections. 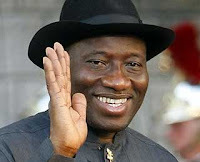 Once he is elected in his own right, President Goodluck Jonathan may decide to confirm Nigeria’s aspirations, not only to belong to the G20 – the world’s leading 20 economies – in 2020 but also to be a superpower in Africa. After all, Nigeria is not only the second economy in Sub-Saharan Africa but with 150 million inhabitants also Africa’s biggest country. One out of every five black Africans is Nigerian. As April 12 1980 was a U-turn for Liberia , I hope that April 12 2011 turns out to be a U-turn for the people of Ivory Coast. The country has all the potential to become one of the region’s leading economies, after Nigeria and Ghana. As the French say: ‘Affaire à suivre’ – which means: To be followed. This entry was posted in Ivory Coast, Liberia, Nigeria, Samuel Kanyon Doe. Bookmark the permalink.